We’d love your help. Let us know what’s wrong with this preview of The Soldier by Claudette Cleveland. _The Soldier_ is a tender and warm story of a young man, some would say a mere kid, who was sent into the service and then to an unpopular war that was half a world away. He was sent from a close and happy family in an ideal climate to a swamp that was infested with snakes, leeches and bugs of all kinds. 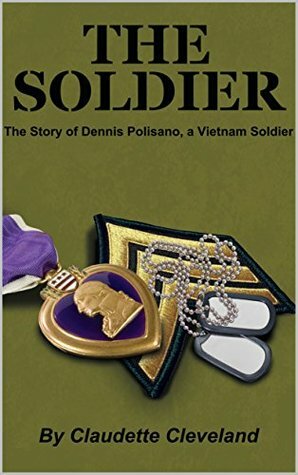 That soldier is Vincent Dennis Polisano, who was nicknamed ‘Polly’ by _The Soldier_ is a tender and warm story of a young man, some would say a mere kid, who was sent into the service and then to an unpopular war that was half a world away. He was sent from a close and happy family in an ideal climate to a swamp that was infested with snakes, leeches and bugs of all kinds. That soldier is Vincent Dennis Polisano, who was nicknamed ‘Polly’ by an army sergeant at his first roll call. To ask other readers questions about The Soldier, please sign up.